After years of living a full-time mobile lifestyle, we know the importance of having a home that you can rely on. This is why our company, by design, is committed to delivering exceptional customer care through every facet of the LV experience. As a lean, tight-knit team who is passionate about the lifestyle that our products offer, we are able to focus on the needs of our customers in a direct and thorough way. Being able to provide LV owners with excellent care begins with designing our living spaces to be easily maintained and serviced. In order to insure that convenient service is available to you wherever you are, we’ve intentionally engineered LV to be worked on by any licensed RV service center in the US. Our manufacturer’s extensive network of experienced technicians as well as our use of domestic components and materials allow service centers to locate the resources they need quickly and efficiently. In the case of a service or warranty claim, your nearest service center should have We believe that life should not be interrupted when your home needs a little care. 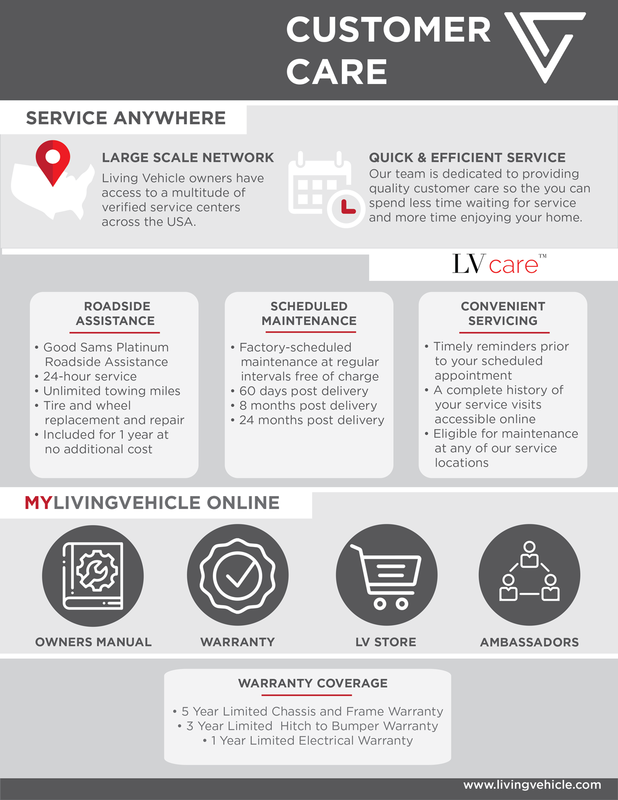 As part of the Living Vehicle family, your exceptional ownership experience starts with LV Care, a no-cost maintenance and service plan. The LV Care Plan covers normal factory-scheduled maintenance for a period of 24 months from the date of delivery. At regularly scheduled intervals, a factory trained technician will perform factory recommended maintenance on your Living Vehicle. We also offer all new LV owners 24-hour emergency assistance provided by Good Sam Auto & RV Platinum Roadside Assistance (not affiliated with Living Vehicle Inc.) for a period of one year from the time of delivery. Each LV Owner will receive a dedicated MyLivingVehicle account, accessible online. Here you will view your owners manual; your warranty and service records; an accessories store; and your Customer Ambassador account. LV Owners will also receive access to an online forum where they can connect with one another and have their questions answered by the LV community.